They’re building a trail past Jim DuFresne’s house and the main blogger for MichiganTrailMaps.com can’t wait until the official dedication next spring. In this Trail Talk Jim writes how this short trail will change his life. We’d also like to thank everybody who has supported us the past year by checking out our new web site, downloading our maps and purchasing our books. As always our eshop is open if you need a trail map or book. Here’s to a great 2018 and we’ll see you on the trail. Next spring a new 1.6-mile paved path will be dedicated in Independence Oaks County Park, the largest unit in the Oakland County system, and when it is my life will be changed forever. Independence Oaks was already the largest of the 13 parks managed by Oakland County Parks when in 2011 the adjoining 188-acre Upper Bushman Lake section, dubbed Independence Oaks North, was added to increase the total acreage to almost 1,500 acres. This amazing park includes a half dozen lakes and ponds, the headwaters of the Clinton River, a series of rugged ridges that top off to nearly 1,200 feet and vast stretches of marshland. It was the marshland that was the problem. The short path in Independence Oaks North could not be connected to the 12 miles of trails in the existing park because wetlands made the cost of such a connecting trail prohibited. Boardwalks are expensive. So officials proposed a paved path that would stretch from the park’s main entrance along Sashabaw Road – best known as the I-75 exit to Pine Knob Ski Area and DTE Energy Music Theater – to the new entrance for Independence Oaks North. It just so happens that the south end of the proposed path would also connect to the Independence Township system of safety paths while near the north end is the entrance to my neighborhood. The new trail that will connect the entrances of Independence Oaks County Park. For 25 years when I wanted to ride my bike to the stores, banks and post office in Clarkston, as opposed to driving, I first had to endure 1.6 miles of Sashabaw that was anything but friendly to cyclists. Most of that stretch didn’t have paved shoulders and after 3 p.m. the rush-hour traffic was brutal. A biker was killed there once and for years I had to ride past the small memorial his family set up. It was unnerving to say the least. 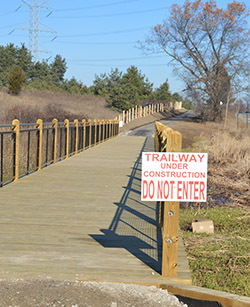 Then park officials teamed up with the Independence Township Safety Path Committee and together they put together the funding for the new connecting trail. I’ve been watching them work on that trail all year with excitement, knowing next spring I’ll be able to pedal worry-free to downtown Clarkston and beyond. Even if it’s after 3 p.m. It will be a life changer for me. I’ll ride my bike more, drive less. Save on gas, get more exercise, totally enjoy a nice day while still getting my daily errands done. But there is a cost for my liberation from vehicles going 50 mph within a foot of me. The tab for 1.6 miles of paved path past my house is $1.2 million. Or $142 a foot. Grant it, this short trail needed a bridge across a stream and two long segments of boardwalk where it skirted wetlands. Boardwalks and bridges drive the cost up of any project. Still there’s no getting around it. Trails are expensive. “People rarely realize how much it costs to build a trail,” said Zack Crane of Oakland County Parks. Even if it’s just a footpath in the woods. This is the time of year when many of us write a check to our favorite charities and causes if for no other reason than to gather another deduction for our taxes. This year seriously consider giving to one of the many fine trail organizations throughout the state. Organizations like Michigan Trails and Greenways Alliance, supporters of rail trails; TART Trails; Top of Michigan Trails Council; West Michigan Trails & Greenways Coalition; Michigan Mountain Bike Association; and the list goes on and on. You can give to a particular trail like the North Country Trail or to one that is in the planning stages. 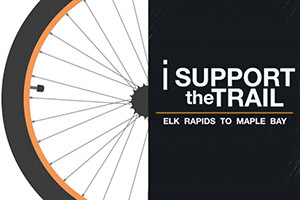 The proposed trail from Traverse City to Charlevoix is an example of the latter and a GoFundMe page has been set up to help pay for preliminary design of the first segment between Maple Bay and Elk Rapids. Connecting the Tart Trail in Traverse City to the Little Traverse Wheelway that extends from Charleviox to Harbor Springs would create one of Michigan’s great trail systems. It would be scenic, practical and offer many who like to vacation in that corner of the state or those of us who have a place there an opportunity to leave the car in the garage more often. Please consider giving. Trails cost money – usually much more than you think – but they can be a life changer.